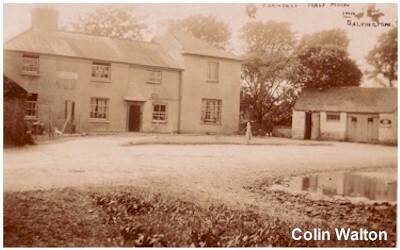 The Half Moon Pub in Half Moon Lane Salvington, has been a difficult building to pin down. My original suspicions proved to be incorrect, but thanks to a marvellous discovery by Colin Walton, a fellow researcher, who discovered this very rare picture postcard in a collection belonging to a relative this has been solved. 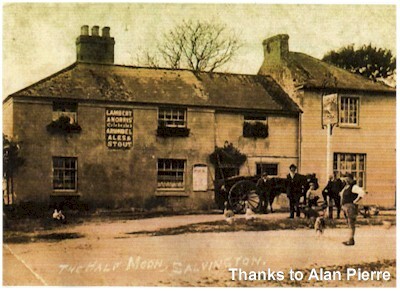 The postcard shows The Half Moon shortly after it closed as a Public House. 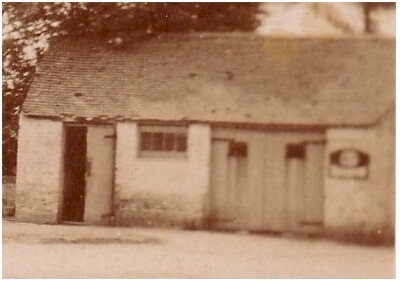 The main building at this time, had two distinct functions, one as Salvington Laundry - left side- and as a Tea room on the right. The puddle on the right is actually part of a large pond. 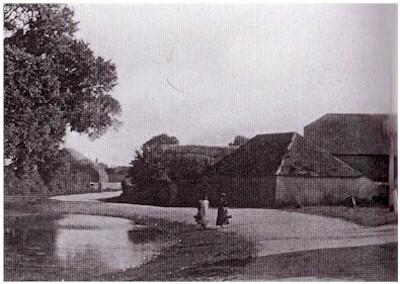 The original pond was a half moon shape and possible gave its name to the pub and lane? 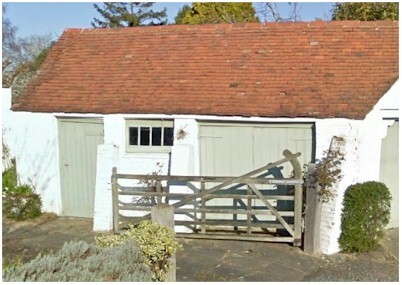 The two pictures above depicting the outhouse clearly confirms that the current building in Half Moon Lane was indeed the pub. Very little has changed as you can see. It would appear a strange place to build a pub perhaps. However, further investigation reveals that at the time, the only way down to Worthing was via Broadwater, or Half Moon Lane to Tarring Village via roads that were little more than wide dirt tracks. As time passed and better roads developed with the coming of motorised transport, it was inevitable that a more direct route carried the masses. This resulted in the isolation of smaller villages and the population of Salvington alone couldn't support its three pubs. Now a private residence, it remains almost identical to the original structure. The pond has since been covered by the road. A better picture of the pond in Half Moon Lane. Just visible to the extreme right, but unfortunately unreadable, is the Pub sign atop a pole. 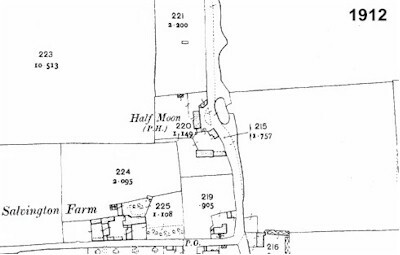 "While in Salvington to the north of the John Selden public house stood another, the half moon, with its pond opposite - very useful for skating. 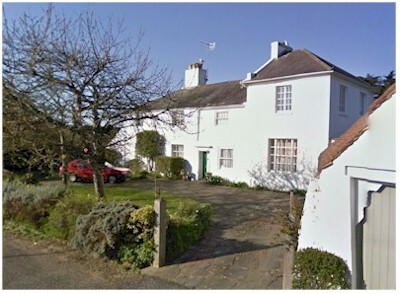 This is now a private residence"
Right - Census entry in 1901. A picture kindly donated by Deborah O'Boyle taken around 2000. Deborah is distantly related to the Linberry family, the first landlords of the Half Moon. Ellen Linberry ran the pub and tea room whilst her husband George worked as a agricultural labourer and mill loader. George died in 1877 and Ellen carried on the business. Ellen's father Richard West and her brother, also a Richard, were wheelwrights, one of which later became the landlord of the pub. The landlord list below shows a different order of ownership but details are often sketchy - more research needed. Just when you think you've discovered all that there is, something else pops up. 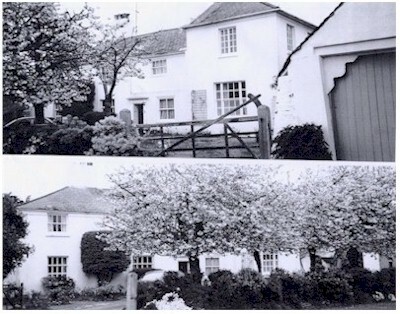 Alan Pierre is the great great grandson of Alexander Pierre, the landlord of the Half Moon, and sent in the picture on the left of the building operating as a pub. We would like to imagine the white shirted gentleman in the waistcoat is Alexander himself. He ran the business with his wife Mary and had five children. Alexander and his wife are buried in Broadwater Cemetery. 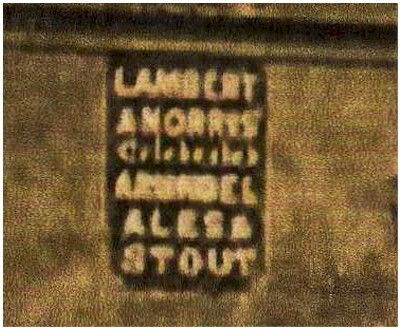 A close up of the sign on the wall reveals they purchased their beer from Lambert & Norris based in the Eagle Brewery in Arundel.